Two day ago I came across a graphic that was shared on Facebook and decided it was worthy of writing a blog post. Not so much because of the graphic, but because it gave me the opportunity to test out explaining an observation I have been making lately. Unfortunately, the graphic I chose to illustrate the theory turned out be photo-shopped and wasn’t real. I am sorry I chose to perpetuate it. I should have been more careful and for that I am deeply regretful. Not because the photo did any harm to the Romney campaign; inasmuch as it quite easily (based on past experience) could have been true, the damage is minimal, but because it served to compromise my integrity, which is something I work very hard to not do. So . . . I wish to be very clear here. I am sorry I published it. It’s not real. For those reading this who are uncertain of the controversy, I herewith submit the photo I was bamboozled by, which I have labeled Exhibit A, alongside the photo from Zazzle, labeled Exhibit B, which was the main piece of evidence that convinced me I had been mistaken. 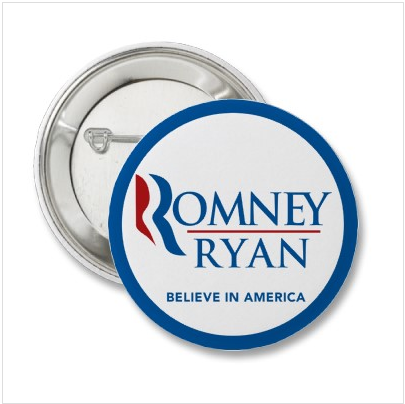 There were a couple of people who pointed me to the official Romney website store, which stated the following, “All Products are Made in the USA”. However, these are politicians we’re talking about here and, as far as I’m concerned (whether it’s the Romney campaign or the Obama campaign), the only thing that proves is it says “All Products are Made in the USA”. ¡Punto, final, y redondo! The ironic thing about this particular post is that, until two days ago the busiest single day I had experienced on this blog was slightly over two years ago. It was from a post I wrote thanking the gentleman who found my iPad after I had left it behind during a medical crisis involving my youngest daughter. I’ve had days that came close, but my post of two days ago more than doubled the number of readers I’ve had in a single day. A Pyrrhic and bitter accomplishment at this point. I doubt any apology will be accepted by some and that’s OK. I could have just let it go. In fact, I apologized immediately on Facebook and even pointed out the fallacious button on a local Facebook group devoted to discussing local politics and business but, partly because the most active people tend to be politically active as well, sees its fair share of discussion on national issues. Now I’d like to offer a little explanation. I wanted it to be true! Yes, I admit it. To be honest, I think electing Mitt Romney as our next President would be disastrous. I can find a lot of things to be pissed off at Barack Obama (and the Democratic Party, for that matter) about, but at least there has been a reasonable amount of social progress during his administration. As well, he inherited an economy strapped by two unfunded wars, a giant Medicare pharmacy giveaway, and some of the stupidest tax policies designed to benefit the wealthiest of all Americans at the expense of most ordinary Americans. So, I won’t, at this point, go into much detail as that isn’t my purpose in this post. 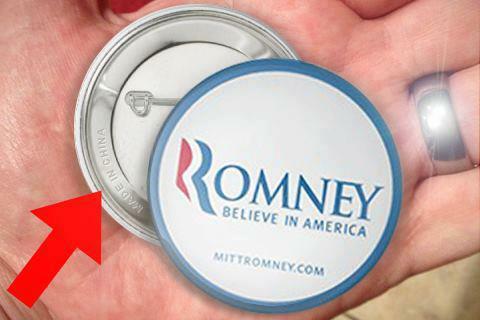 I just want to point out a few things that made it easy for me to believe the Romney campaign would have their buttons made in China. More than 10,000 torch-bearers during the 2002 Winter Olympics, which Romney holds up as one of his crowning business achievements, were contracted out to a brutal dictatorship in Myanmar (Burma). Read about it here. Senate Bill 3364, the “Bring Jobs Home Act”, which provides up to a 20% tax credit for bringing businesses back to the U.S. and denies tax deductions for outsourcing expenses incurred in relocating a business outside the U.S., was blocked by Republican Senators. More here. Romney has not only been labeled by his former Republican primary opponents as a “Vulture” Capitalist, the National Venture Capital Association has specifically disowned him as one of them (though it’s killing them to do it). His company, Bain Capital, is well-known for its role in shipping jobs overseas.